Motion Blur is the illusion of moving objects in still images. 3D applications create this effect usually by rendering several images of an animation and mixing them together as a blend effect. This is in contrast to an ordinary still image in which everything appears is focus as if it was shot with very fast film under ideal circumstances. Here’s how to create this Motion Blur effect in Blender. If we create a render now it will show the character with the hand to the left. 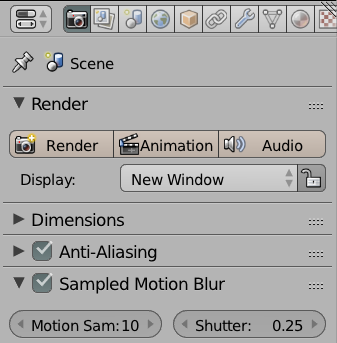 Now let’s add Motion Blur: head over to the Camera Icon in the Properties Palette (those are the render settings Blender) and tick the box that reads Sampled Motion Blur. 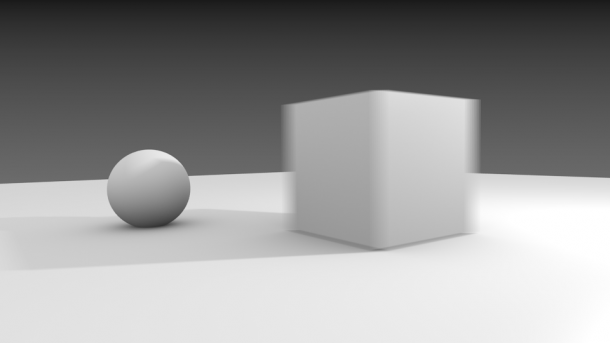 Note the two values you can set here: Motion Samples are the amount of images that are rendered and mixed together. Fewer images mean quicker render times of course, but it also depends on how fast your object is moving: a slow moving object will require more frames for the motion to be visible. Shutter means the shutter speed of the camera. Higher values means a slower shutter speed, and hence more exposure during the movement. The default is 4 Motion Samples and a Shutter Speed of 5. Experiment with these values to get the effect you’re after. As a rule of thumb: increasing the Motion Samples will lead to a smoother effect. A longer shutter speed (up to 1) will expose more of the blended images. Shutter speeds above 1 will always create a stutter effect.